In Hatch, we saw that Sparky’s Burgers and BBQ was busy and decided to stop in to see what was happening – pics from outside and the place across the street. When we went in and saw the 20 person line to order we got in the car and headed back to the RV but we now know the place to go eat but not on a Sunday afternoon. After looking at the menu, I understand the line as the prices were very reasonable and I assume the food was good. In case you ever wonder what serious laying around in the coach looks like, this is it. 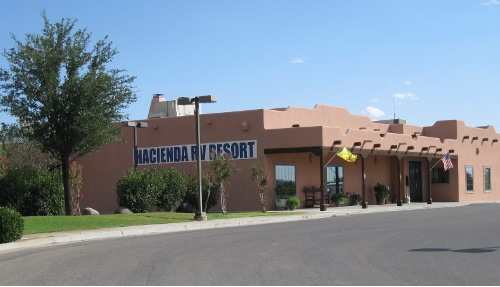 Here are my thoughts on the Hacienda RV Resort. They bill themselves as a resort and while not as high-end as some, I have to agree. It has nicely paved slightly curbed roads, well maintained gravel sites that are laid out in different ways and very level and well maintained. Our site (#176, $56/night total cost) enters from one direction while those beside us are the opposite such that our utilities sides (drivers sides) face one another. Then the sides we use for being outdoors also face each other but there is plenty of room and a fence between us and our neighbor. When we arrived, the check-in process was friendly and efficient and when we went looking for info about the area, the young lady at the desk was very knowledgeable. 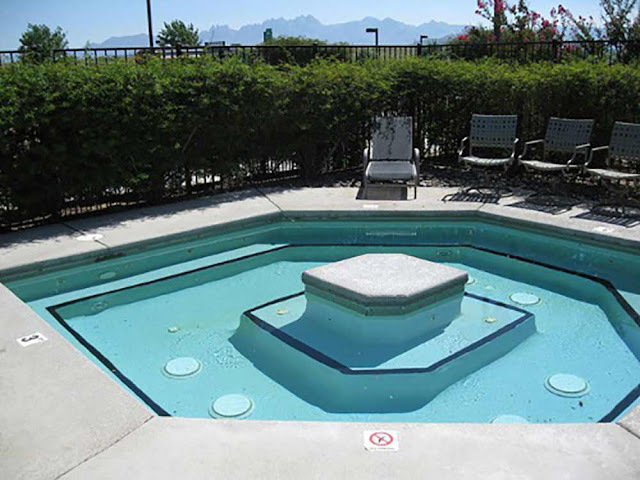 The utilities, cable TV and WiFi all worked very well but we didn’t use the other amenities – lack of a pool might be a big negative for some campers. The resort is located very convenient to I-10 which can be seen from our site but there was very little road noise. I would definitely stay here again. On Monday, we pulled out at 9:30am for the 275 mile drive to Tucson, once again on I-10. The road surface was pretty rough from Las Cruces to the AZ line at which point it got much better and was fine into Tucson. Remember my comment about being surprised about white men fighting the Indians for West Texas, it goes double for southern NM and AZ – maybe it will grow on me over the next five weeks. We pulled into the Lazy Days KOA about 3pm and did our usual – walk the dogs, get set up, relax with a glass of wine then finish off any leftovers for supper. I'll be reporting from the Tucson area for 24 days before we move again. Hope you enjoy your time in Tucson, There is something special about the southwest desert. You either love it or hate it,We have a few friends that have been here and won't come back, yet we fell in love with these wide open spaces and clear blue sunny skies 13 years ago on our first visit. Enjoy your time in Tucson! And I agree on your assessment about the landscape along I-10. I feel like our awesome travels. I love the desert. But you either love it or hate it. Guess that's a good thing because there wouldn't be enuf room for everybody. Hope to see you guys. Nice to meet you Big Dude. Thanks for finding my blog. As George says, you either love the desert or not. My Oregon daughter refers to it as White Hot Nothing, and rolls her eyes at me when I head for the Southwest deserts every year. I'm with you though, West Texas isn't my kind of desert at all. We just left Van Hirn heading east. Glad you made it to Tucson. Hatch is most certainly an interesting place. We spent about an hour there and I would have liked to have spent more time. And I wanted to eat at that burger joint. Look forward to your adventures in Tucson. 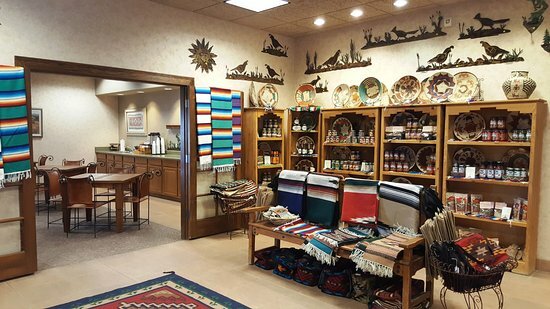 Are you panning on a side trip to Tubac? I wish Sparky's wouldn't have been busy - It would have been cool to hear if the grub was tasty. It looks like a funky little place.